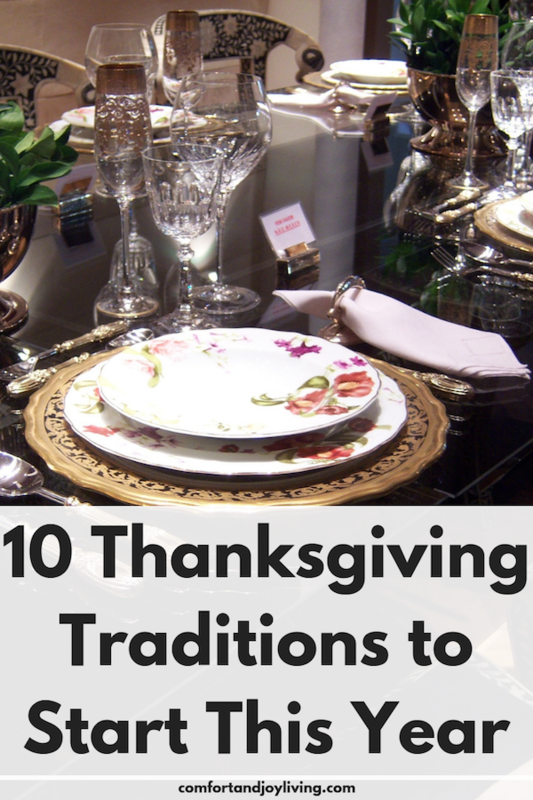 What makes holidays like Thanksgiving so memorable? Long after the meal is finished, the memories that families hold onto are the special traditions that you share together. If you’re looking for some new Thanksgiving traditions to start with your family, try one—or more—of these this year. A thankful tree is a fun way to share what Thanksgiving means to each person. You can free draw the shape of a tree with lots of branches from a large brown sheet of paper and tape it to your dining room wall or refrigerator. Then, cut out leaf shapes from various fall shades of paper. Give each of your guests a leaf and a pen to write down what they’re thankful for. You can even read what everyone wrote aloud as they’re attached to the tree or during the meal. 2. Create a Keepsake Tablecloth. Buy a durable tablecloth and have everyone present sign their names on it. If there are children who too young to writhe their names, have them place a handprint on it. Use the same tablecloth each year. You’ll love to see how your family has grown and it’ll be quite special too see the handwriting of those who have passed after years have gone by. Help the kids make pilgrim hats and read the story of the first Thanksgiving together. Gather items to decorate the table like the pilgrims may have had for the first Thanksgiving, such as pine cones and a cornucopia filled with fruit. Talk about how different life was for kids in 1621 compared to today. If you have older kids, let them do research and share what they learned. Make it a game to find a new, unusual fact about Thanksgiving’s past. Give a prize to the person with the best answer. Organize a Food Drive—Kids can pick up canned and nonperishable food items from around your neighborhood, which you can deliver to a local food bank. Donate Toys—Ask your kids to find a few toys to donate to a shelter or charity for other children. Visit an Assisted Living Home—If you’re free on Thanksgiving morning, call ahead to an assisted living home and find out what they need. Sometimes, something as simple as reading a book to some residents can brighten up their day. Of course, everyone loves Grandma’s pecan pie recipe and Aunt Mary’s cranberry sauce, but your Thanksgiving food traditions don’t need to end there. If you’ve inherited old recipe cards or cookbooks from family members, there’s no better time to look into these than on the biggest noshing holiday. Choose something in the holiday theme or just something delicious from a time gone by—even if the recipe doesn’t become an immediate hit with your family, the adventure of trying them out is half the fun. Don’t come from a family of cooks? Not to worry. Take this chance to try something new, like rosemary focaccia stuffing or a gluten free dessert that you’ve been dying to try—you never know what’s going to become your family’s next favorite. On a day that’s for spending time with the people that you care about most, set aside some tie to think of loved ones that have passed on. Have everyone gather together and share a story or a special moment that they remember. Through these memories, we keep our loved ones alive in our hearts and we can pass on family legacies to the next generation. The larger your family becomes, the harder it is to get everyone together for the holidays. But even if some of your loved ones can’t make it to the celebration, there’s no reason not to see them on turkey day. Embrace the wonders of technology and set up a time to video chat with everyone that you’re missing during the holiday. If you live in a climate that allows it, why not get out and take a walk? Everyone can get some exercise while talking about what their favorite float in the parade was, or who they think will win that night’s football game. This is a fun way to keep kids of all ages entertained after your Thanksgiving meal. Early in the day, you can have teens or adults make up scavenger hunt clues and hide them around the house or yard. When dinner is over, send the little ones out to search for all of hidden hints, leading them back to the spot where you placed the turkey’s wishbone. Have everyone write a few things that they’re thankful for on slips of paper and place them in a jar. Then let everyone take turns drawing a slip out and try to guess who put which “thanks” in the jar. Not only is this a fun way to see how much you all know about each other, it also encourages everyone to be creative about what they’re thankful for this holiday.